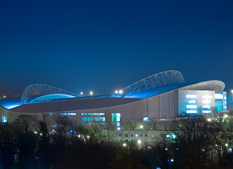 Home to Brighton and Hove Albion the Falmer Stadium known as the AMEX stadium is a 30,750 capacity football stadium. Built in 2008 it was officially opened in 2011 with the first competitive home game being played in August of that year. As well as playing host to football the stadium also designed for rugby and hockey and has been selected a venue for the 2015 Rugby World Cup. 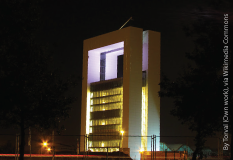 Built as a symbol of innovation, the 7,000 square metre, 11 storey Innova Tower is located in the Dutch city of Venlo. The building comprises of a mix of commercai and events space. Luxor International Airport is the main airport serving the city of Luxor. It is used by many charter airlines as it is a popular tourist destination for those wanting to visit the River Nile and the Valley of Kings. The airport is served by Thomson Airways, Air Berlin and Qatar Airways and can accommodate up to eight million passengers each year. Based in Paphos, Cyprus, the Aliathon Holiday Village Hotel is set in a 14 hectare estate and has two themed villages, the Aegean and the Fishing Village. Situated 150 metres from the beach, the village has been designed with traditional architecture and environmental sustainability in mind, featuring luxurious rooms and a wide range of leisure amenities on site. City University is a pubic research university located in London. Founded in 1894 as the Northampton Institute, it became the City University under Royal Charter in 1966. Its main campus in is the Islington area of central London with additional sites in Holborn, Smithfield and Whitechapel. Home to the Chapel Allerton Orthopaedic centre and a specialist dermatology ward, Chapel Allerton was originally based in the stately mansion of Gledhow Grange. The hospital began to expand in the 1950s and in the early 1990s the new Chapel Allerton hospital was built alongside.